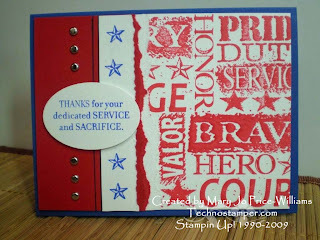 Techno Stamper: Thank God for our Veterans! Please remember or Veterans and our active military as your go about your day today. We would not be doing what we are doing without them! God Bless the USA and all who have fought for our freedoms! If you are in the Orchard Park area please keep you eyes open for our cards for soldiers event that will take place in January! We know that many are sending cards now through Christmas so we will begin with the new year. 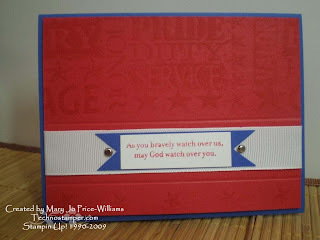 We will be creating the following two cards in multiples and adding heartfelt messages to the inside for our soldiers. You will be able to learn more about it on our St. John's Women's Ministry Blog when the time arrives. We are still in the planning stages. Enjoy your day thanks to all those who came before us!